We are proud to have opened a brand new state of the art showroom in Andover where we display an extensive kitchen range, with a massive 16 displays available to view. The showroom combines an exciting mix of contemporary and classic designs, with unique features and captivating colour combinations. We celebrated the opening of our New Showroom with an official opening by Iris Andersen The Mayor of Test Valley and a wonderful Champagne Breakfast. The opening was a great success and attended by customers old and new, family and friends. We have brought the magical touch from Winchester to Andover boasting over 14 years experience in the industry. 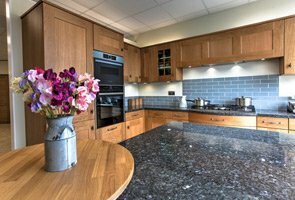 We are specialists in the design, supply & installation of luxury fitted kitchens, bedrooms and home studies. We can manage your complete project, provide bespoke furniture and work with Architects and Interior Designers.